Wedding Invitations | Top 6 Things You Should Know! When you're starting to thinking about wedding invitations, it’s easy to get excited and overwhelmed at the same time! 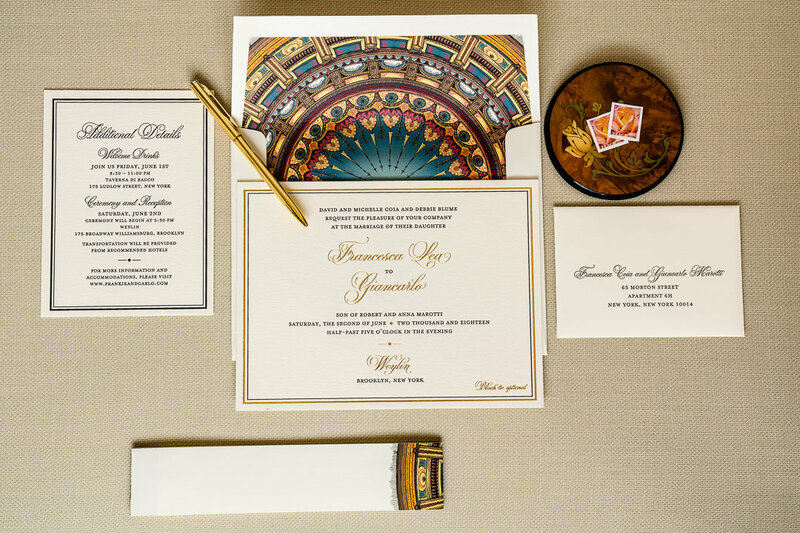 This is why we asked our friends over at Lion in the Sun to give us their top 6 things you should know before you purchase your wedding invitations! Lion in the Sun has been around for over 11 years. They serve clients from Brooklyn, New York, and the surrounding area. 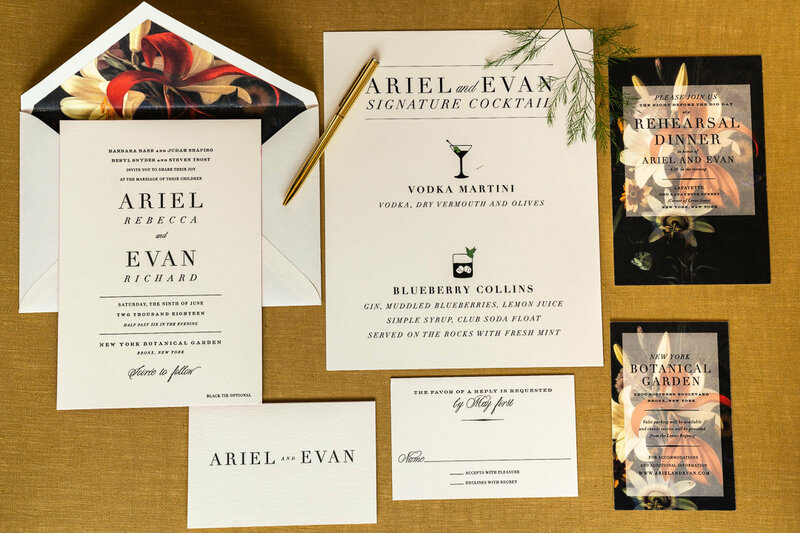 Experts in their field, they provide their clients with a variety of beautiful, timeless wedding invitations. 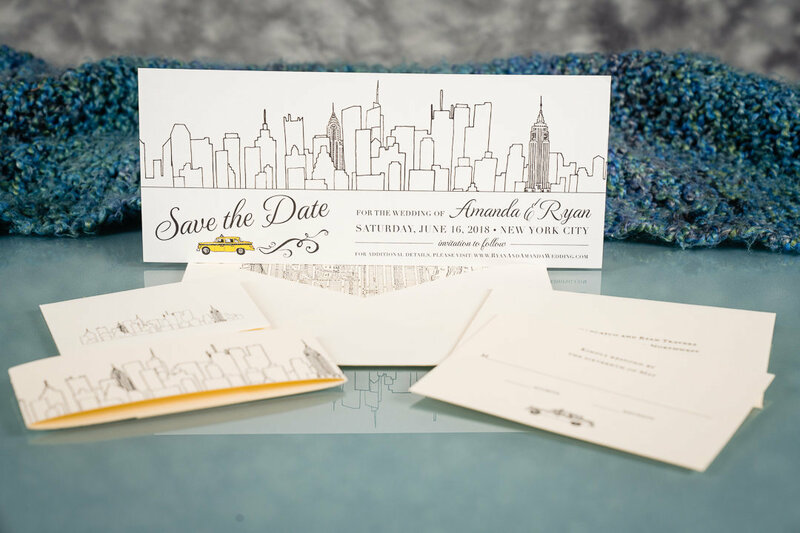 Our personal favorite is their custom design you see here with the New York skyline theme! 1. When Should We Send Our Save the Dates and Invitations? Save the Dates are Traditionally sent 6-8 months before the wedding unless it is a destination wedding and then they can be sent as far as 12 months in advance. 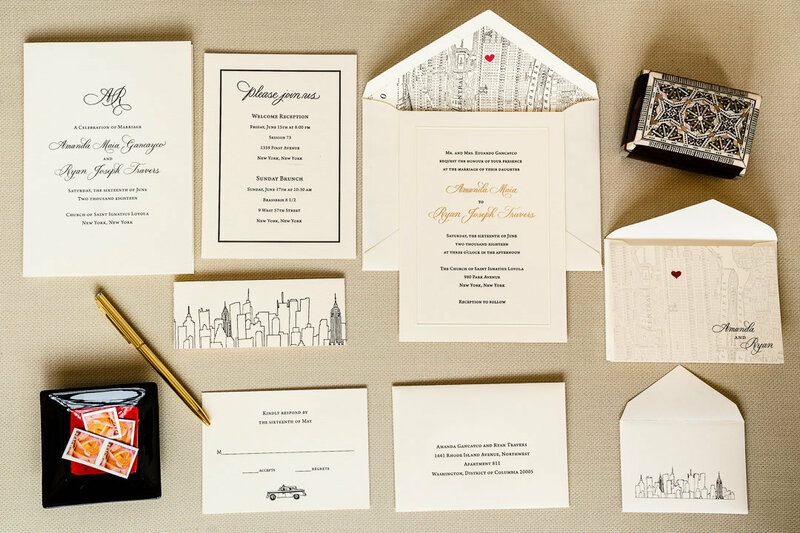 Invitations are traditionally sent out 6-8 weeks before the wedding but modern etiquette has changed and more typically invitations are mailed 8-10 weeks in advance. 2. Who gets a plus-one? There is no hard and fast rule here that is largely dependent on the hosts wedding. Typically, all single adult guests should be invited with a guest. But with more intimate venues and tight budgets, this is not always feasible for all guests. More typically, we see plus ones reversed for couples with more serious relationships. The single guests who may not know anyone else at the wedding and could feel awkward attending solo. This should be one month before the wedding. if your venue requires a final count of more than one month in advance then 5 weeks is also acceptable. Remember most guest will reply prior to the listed RSVP date. This date is the last possible day to reply and generally, it will only apply to a few stragglers. 4. Should we include dress code information on the invitation? Traditionally Dress code is reserved for Black tie weddings, we see Black-tie Optional, Black tie invited or Black tie welcome commonly as well. However, we recommend for less casual weddings also including a dress code so guests are informed if the dress code is more casual like cocktail attire or casual attire. Otherwise, we recommend not putting anything as the time of day and location. This should alert your guest of proper attire and sometimes more "modern" attire listing of festive attire or country chic is simply more confusing to guests. 5. What if we don't want to invite kids? Your indication or inviting children or not is indicated on the addressed envelopes. If your child's name is not included on the front of the envelope, then they are not invited to the event. Most guests are aware of this convention. However, some couples do opt for the subtle place to add adults attending on the rsvp card ie ___ adults attending while this is not traditional it is a respectful way of just reiterating that adults only should attend and we do find that for some clients this puts them more at ease. 6. Should we invite guests we know can't come? Definitely.... with the invitation, you are indicating you would like for them to be there ( whether or not they can attend). In fact, if guests reply to a save the date to say they will not attend, you should absolutely still send them an invitation. If you would like to add a personal note that you are sorry they can't attend that is a nice touch. But if you don't send an invitation that indicates that they are no longer invited to the event.